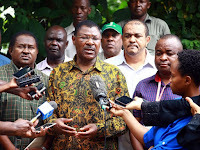 Wednesday January 30, 2019 - Bungoma Senator, Moses Wetangula, has urged Orange Democratic Movement (ODM) party leader, Raila Odinga, to endorse Wiper’s Julias Mawathe in the Embakasi South by-election. In a statement on Wednesday evening, Wetangula, who is also the Ford Kenya party leader, said that Wiper, Ford Kenya and ANC have always supported ODM candidates in such situations and it was time for the Orange Party to reciprocate. "In the spirit of the Nasa brotherhood, it’s not good to create bad blood. Our move is positive towards uniting Kenyans, our brothers in Jubilee have shown the way and we expect that from our brothers in ODM,” Wetangula said. The seat fell vacant after the Appeals Court nullified the election of Mawathe following a petition filed by former MP and ODM candidate, Irshad Sumra, who lost the August 2017 election. “In 2013 we all headed to Siaya to support Rasanga, same to the by-election relating to Moses Kajwang and Khatib Mashetani,” he said. Wetangula’s statement comes a day after Wiper leader Kalonzo Musyoka said the seat belongs to Wiper and called on ODM to support Mawathe. “ODM had a candidate who went to court but in the interest of what is happening in the country, it would be great if we all rally behind Wiper,” Kalonzo said. ODM has maintained that its candidate is Irshard Sumra.